View video of the Long Beach Unified School District's recent Education Celebration at Cabrillo High School, where elementary, middle and K-8 schools showcased their programs. The annual event attracted more than 1,500 people who visited school booths to talk with school staff and obtain literature. The theme for this year's event was Full STEAM Ahead, as in Science, Technology, Engineering, Arts and Mathematics. "I really enjoy talking with families," transitional kindergarten teacher Kris Damon said. "They tend to have such a sense of relief after they talk and get questions answered. Parents can be a little anxious and don't know what to expect when they're entering the school system, and when they visit here they can see that people care about kids. That is really just a great piece of the whole celebration." 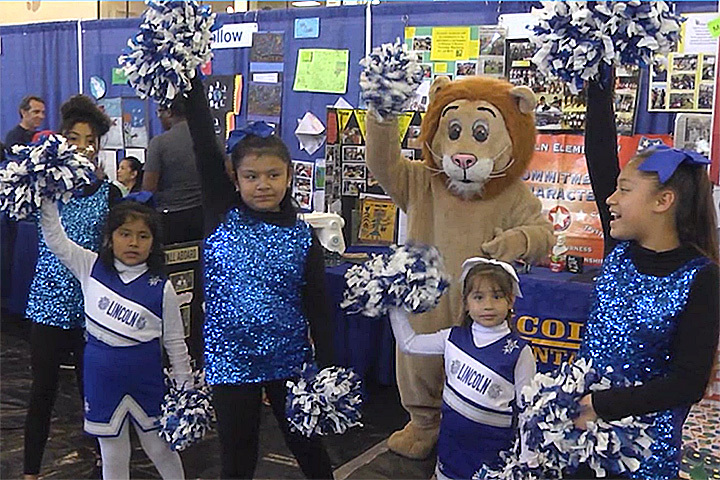 CELEBRATING EDUCATION – The Lincoln Elementary lions help set the tone for the Education Celebration.